Black Hole offer a potent mix of Dark/Occult Prog the Italian way. Back in the 80s, bands coming from Italy had a real hard time trying to get some attention; puplic recognition was even more scarce (Necrodeath and Bulldozer may be the exceptions that confirm the rule). 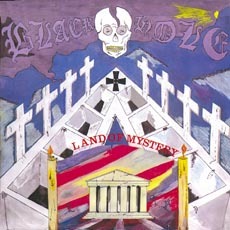 Black Hole released ’Land Of Mystery’, their 1st full-lenght in 1985; back then, their music was strictly rooted in the 70s: a potent mix of Dark/Occult Prog, the Italian way (think Goblin, Jacula and the likes, adorned with some keyboard lines in the finest tradition of Ange and Can), Black Sabbath (heavy dark occult riffs) and a bit of NWOBHM (for the overall melodies). The whole thing could be reminiscent of Witchfinder General, albeit one with a Jess Franco fixation. The whole mastermind behind it was Roberto 'Measles' Morbioli (following the 70s Italian movie tradition, he took an English sounding nickname for exportation purposes), and one can say that for an opus released well in the mid-80s, it sounds damn 70s (‘Demoniac City’ has a 'Pentagram with keyboards' vibe). Since then, this album has become a cult object, not only for the Italian scene, but also for the very few that were aware of the existence of Occult Metal/Doom/Rock years before 2010 (and the collective impact of The Devil's Blood, Blood Ceremony and Ghost on the scene). If we forget the rather curious Italian accent for a moment, the album still sounds good for its age. The arrangements are dark and occult enough, the riffs are well executed (however, some are blatant rip-offs, like the main riff to ‘Land Of Mystery’ being simply the one from ‘Electric Funeral’) and there's that great sepulchral and foggy vibe in the music that only the Italians were able to create, whether in music, movies or even comic books (Zara The Vampire and some horror fumetti come to mind). A lot of praises must go to Black Widow Records for having (re)discovered and (re)released this fine piece of Occult Metal: ‘Bells Of Death’, ‘Blind Men And Occult Forces’ or the 2 bonus tracks taken from the most Cosmic Rock oriented next LP ’Living Mask’ (and especially ‘Angel Of Lucifer’ which sounds a bit like ‘Transylvania’ from Iron Maiden) guarantee to summon Lucifer into your living room to share some beers.